Ablation is the process of melting and stripping material. The means of heating is often incorrectly assigned to frictional heating. Whilst this is a source of heat, it is minor. The heat that melts the tektite is primarily due to ram pressure (Plait, 2002). A tektite entering the atmosphere at high velocity compresses the air in front of it. When a gas is compressed it becomes hot. Essentially the kinetic energy of the tektite is converted to heat. In detail, the situation is slightly more complex (see Figure 9.1). When a tektite re-enters the atmosphere at a high velocity it rapidly compresses the air in front of it and a shock wave is established ahead of the tektite. 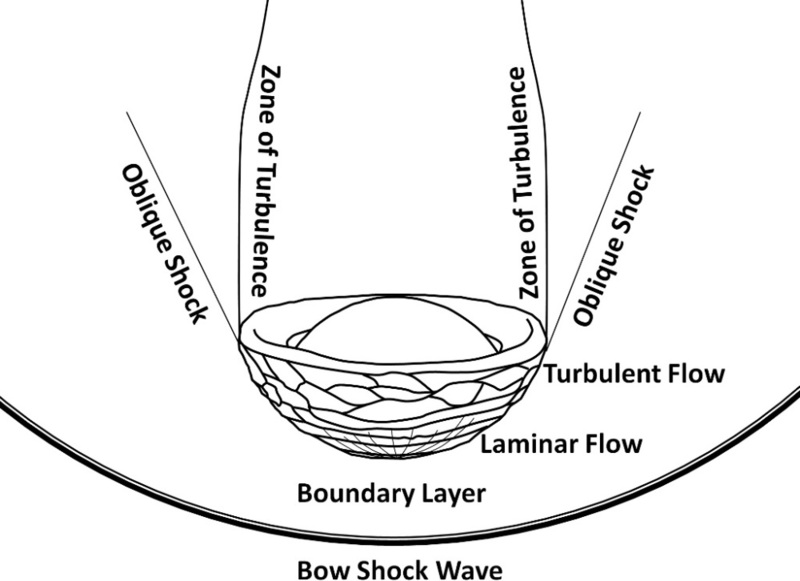 In-between the tektite and the shock wave is a boundary layer, which is a relatively slow moving pocket of air. The shocked air in front of the tektite is violently compressed, resulting in the air becoming very hot. This heats the air in contact with the anterior of the tektite. The anterior surface of the tektite melts and the air flowing over it strips off the melted portion in a process called ablation. According to Chapman (1964) ablation in tektites ceases below 5 km/sec. The shock wave and heating, to some degree, would persist until the velocity of the tektite became sub-sonic. Figure 9.2 shows the shock wave phenomena in air at high Mach number. Ablation is the process of melting and stripping material. In tektites it occurs during the re-entry stage of bodies travelling at high velocity (in excess of 5 km/sec). FIGURE 9.1: As the tektite re-entered at hyper-velocity it established a shock wave of hot compressed air ahead of it. This hot compressed air in the boundary layer, resulted in ablation. The melt flows in ridges from the anterior towards the posterior flange, initially as laminar flow (with ringed or spiral flow ridges) then breaking down to turbulent flow (with anastomosing flow ridges). This diagram is not to scale. Taken, in part, from Baker (1958). FIGURE 9.2: Shock wave phenomena in air at high Mach number. There is a high pressure region at the stagnation point and a partial vacuum behind the body. The hot gases expand from the high pressure region and collide at the implosion point. A weak shockwave is formed, which traverses the hot train and emerges into cold air. This diagram is not to scale. Reproduced from Vand (1965). Within the Australasian strewn field it is only tektites found in Java, southern Indonesia or equivalent distances and beyond, in Australia, that are ablated. According to the model, javaites re-entered at around 20 degrees and ~5.3 km/sec and australites likely re-entered at around 10-15 degrees and ~6.5 to 6.9 km/sec. The fact that Javaites are ablated means that they must have entered at an angle below 30 degrees or they would have had insufficient velocity to ablate. The distal tektites furthest from the source, e.g. those from Victoria, Australia, exhibit greater ablation as they re-entered at a higher velocity and lower re-entry angle. The distal tektites closer to the source, e.g. those from Java, Indonesia, re-entered at a lower velocity and higher re-entry angle: Both of these factors reduce ablation. The Australasian strewn field is the only tektite strewn field in which distal ablated, flanged tektites are found. This may be a reflection of the young age of the Australasian strewn field. It is, however, hypothesised that only large low angle impacts will produce distal tektites. Smaller low angle impacts, or larger higher angle impacts may result in only proximal tektites (equivalent to indochinites) being formed or only proximal and medial tektites (equivalent to indochinites and philippinites) being formed. All distal Australasian tektites, large and small, were ablated during their initial re-entry. All distal tektites, with the exception of a few elongate forms that rotated about the roll axis, are oriented. As discussed in the plastic deformation section, this orientation is unlikely to have arisen by chance. The distal tektites, all travelled in excess of 5 km/sec, which is considered the minimum velocity required for ablation by Chapman (1964). They followed the ablation sequence outlined in Figures 9.3 and 10.17. FIGURE 9.3: A diagram demonstrating the ablation sequence for distal tektites. Note that a slightly plastically deformed re-entry body is assumed. Black specimens = final distal morphologies. 1 Primary sphere or spheroidal body. Only the very small to medium-sized bodies were sufficiently thermodynamically stable to survive intact. The majority of australites are small, probably due to a cascading effect of a high temperature, low viscosity melt at high altitudes during the ejection phase. The author would classify very small australites as having primary morphology minor diameters under 10 mm, small australites as having primary morphology minor diameters of 10-18 mm and medium australites as having primary morphology minor diameters of 18-29 mm. The ‘minor diameter’ means the spherical diameter, the width of a spherical ellipsoid. FIGURE 9.4: A 4.7 gram australite button found near Port Campbell, Victoria, Australia, 21.5x21.5x10 mm. Left: Posterior view. Middle: Oblique side view. Right: Anterior view. (Catalogue # VA1117172). In very small bodies a cored plate is formed (see Figure 9.5). Ablation continues and a tiny lens is left with a conical flange forming a cored bowl. 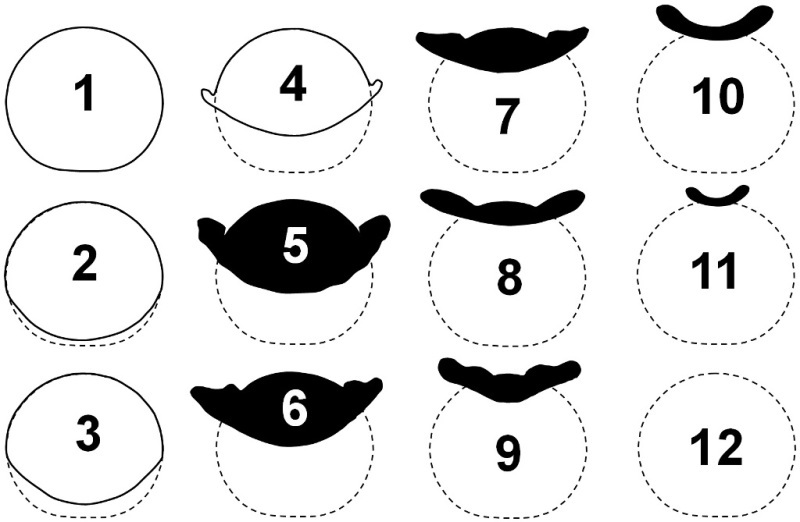 Eventually even the small lens of the cored bowl disappears, leaving a bowl (see Figure 9.6). As ablation continues the bowl, now a thin hot sheet, may plastically deform, folding together (see Figure 9.7) and/or may continue ablate away to nothing. FIGURE 9.5: A 0.67g australite broad oval plate found approximately 100 km east of Lake Lefroy, Western Australia, 17x14.5x3 mm. Left: Posterior view. Middle: Side view. Right: Anterior view. (In the Whymark Collection, via the Kuchel Collection). FIGURE 9.6: A 0.34g australite bowl found approximately 100 km east of Lake Lefroy, Western Australia, 9x8x5 mm. Left: Posterior view. Middle: Oblique side view. Right: Anterior view. (In the Whymark Collection, via the Kuchel Collection). FIGURE 9.7: A 0.06g australite folded bowl found approximately 100 km east of Lake Lefroy, Western Australia, 7.5x1x3 mm. Left: Oblique side view. Right: Posterior view. (In the Whymark Collection, via the Kuchel Collection). The point the tektite reached on the ablation sequence was dependent on the amount of ablation and the size of the body. The amount of ablation was determined by the re-entry velocity and re-entry angle, both factors related to the distance from the source crater. This is why the more distal australites from Victoria typically possess a wider flange (see Figure 9.8). In Australites one can identify differing degrees of ablation between more proximal and more distal Australian localities. Ablation is less in Western Australia, higher in Victoria. FIGURE 9.8: Comparison of two Australites on the Victorian Ray. Right: A 4.1g, 21.5mm diameter button from Flinders Range, South Australia: Approximately 6,300 km from the source crater. (Catalogue # SA1117521). Left: A 4.7g, 21.5mm diameter button from Port Campbell area, Victoria: Approximately 7,250 km from the source crater. (Catalogue # VA1117172). The amount of ablation, measured in millimetres, will be similar in small and large bodies, but smaller bodies will obviously move further along the sequence as the ablation represents a higher percentage of the body lost. For a fixed size sphere the tektite would move further along the ablation sequence at greater distances, equating to lower re-entry angles and higher re-entry velocities. As the ablation process proceeded, the tektite’s inherited cosmic velocity is lost and the shock wave disappears when the velocity reduces below subsonic values. The anterior surface of the tektite is no longer heated, in fact the frigid high altitude air rapidly cools the anterior. This results in spallation, in all but the smallest bodies, whereby the aerothermal stress shell is lost and a core is produced. The shape of the core leaves a tell-tale sign of the ablative history. This is discussed in the Chapter 10: Spallation. For a fixed location the very small bodies might produce a bowl, the small bodies might produce a plate and the medium-sized bodies might produce a flanged button assuming the aerothermal stress shell is not subsequently lost. With increased distance from the source crater, the very small bodies will effectively totally ablate away, the small bodies would produce bowls and the medium bodies will produce plates to buttons with a thicker rim (indicating greater ablation). The ablation sequence, outlined in Figures 9.3 and 10.17, provides a solid framework for spherical primary bodies. The same sequence can be applied to elongate forms. The author makes the assumption that the orientation of australites is derived from them being subtly plastically deformed during the ejection phase. Almost every single australite had a fixed orientation during re-entry. Specimens which exhibit ablation over the entire surface are exceedingly rare. The author has not handled any examples despite a relatively large australite collection. A few examples are exhibited in Figures 17 and 18 of Chapman (1964). These should be examined for the presence of bubbles which could disrupt balance as the ablation proceeded. The author concludes that over 99.9% of australites had a fixed orientation at the point of re-entry. If ablation were to occur prior to establishing a fixed orientation then tell-tale signs should be evident on the posterior of australites as standard. It is evident that a small percentage of australites rotated about their roll axis (long axis, perpendicular to the flight direction) during re-entry. This only affected symmetrical elongate forms, excluding asymmetrical dumbbells and teardrops. A few spherical forms have also been observed to have tumbled. In this special case a number of morphologies may come about depending upon the size and thermodynamic stability of the specimen and the point at which the tektite gained a stable orientation. Small to medium sized bodies may roll and ablate, creating flow ridges over the entire surface before gaining a stable flight orientation and forming flanged morphologies. An example of a rolled tektite is noted in McColl (2008) and re-produced in Figure 9.9. FIGURE 9.9: The formation of a ’rolled’ australite. Left: The primary prolate spheroid enters the atmosphere and rotation begins. The velocity is very high and ablation is severe. Middle: The tektite decelerates and rotation/rolling ceases. The velocity is lower, the tektite is now covered in flow ridges. The ends become pointed with ablated material flowing from the body. Right: The orientation becomes stabilised and a flange is formed. The velocity further decrease and ablation ceases. The straight arrow represents the direction of travel, with length reflecting velocity. The curved arrow represents roll of the body. Re-drawn from McColl (2008). The second group of rotationally oriented bodies were oriented in the traditional sense, but were clearly rotating around the yaw axis, in line with the directions of travel. In fact most oriented tektites probably had some degree of rotation, but it rarely affects the final morphology. A tektite formed from an originally spherical body, even if there was rotation about the yaw axis, should be identical to a specimen where there was no yaw. In australite buttons, however, both concentric and helical spiral flow ridges are found (see Figure 9.10). Baker (1963) attributes spiral flow ridges to the exposure of inhomogeneities such as schlieren of significantly different chemical composition and/or by the exposure of internal bubbles on the ablation surface. The author suggests that perhaps on exposure of these inhomogeneities, the yaw of the spherical specimen perhaps combined with slight pitch variations, is revealed. FIGURE 9.10: Diagrammatic representations of types of flow ridges forming elements of the ring wave patterns on the ablated anterior surfaces of round australites. Left: Concentric. Middle left: Clockwise helical spiral. Middle Right: Counterclockwise helical spiral. Right: Double helical spiral. The central dot represents the front polar or stagnation point. The larger elliptical spots represent ablation pits. (After Baker, 1956 and Baker, 1963 in O’Keefe, 1963). In elongate forms, particularly bar forms, a rotating body will affect the way the ablated melt forms a flange. Rather than an even flange forming around the body, the flange at the two apices forms a point skewed in the opposite direction to the rotation of the body. The resultant form is known as a ‘canoe’ form. Canoe forms typically form from small to medium sized bodies with about 10 to 18 mm minor axis diameter. Canoe forms are simply elongate, flanged, tektites which have rotated about the yaw axis as they re-entered the atmosphere. Early ideas arising from Fenner (1934) are sometimes repeated, but are incorrect. Canoe forms did not form by the splitting of two teardrops from the end of a prolate spheroid. If this were the case these sigmoidal canoe shapes (minus the flange) should be common in proximal tektites, but they are not evident. An analogy of a canoe form might be an aeroplane propeller, but travelling at velocities sufficient to melt and ablate it. The melted material flows to the ends and is lost. This results in a flanged body with pointed ends. The pointed ends may be bent away from the direction of rotation. 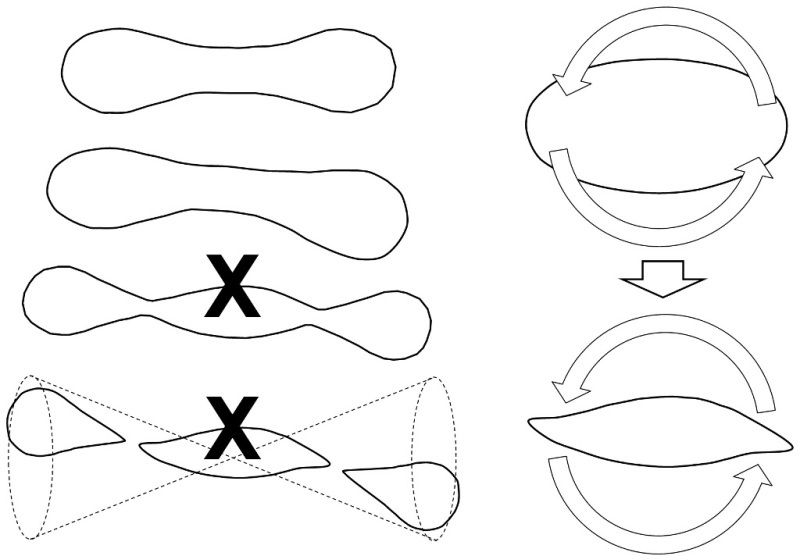 FIGURE 9.11: Left: Canoe forms do not develop by the splitting of two teardrops from a prolate form. Canoe forms are only found in distal areas. If they formed by this method there would be common unflanged canoes in proximal areas. Top right: A prolate spheroid profile viewed from the anterior or posterior. As the solid tektite re-enters it rotates about the yaw axis. Ablation precedes. Bottom right: Approximately 70 to 90% of the prolate spheroid has ablated away. The frontal material melts, flows backwards and cools to form a flange. The yaw results in the melt flow travelling to the ends of the specimen. The melt cools and forms a point. A slightly sigmoidal shape may form due to the yaw. Medial tektites such as Philippinites and proximal tektites such as Indochinites do not exhibit ablation. The cores are also of differing morphology due to lack of ablation. Re-entry heating does occur, but it is insufficient for ablation to occur due to lower re-entry velocities, under 5 km/sec. Medial tektites did not ablate due to insufficient velocity. Philippinites probably re-entered at velocities below 4 km/sec. Proximal tektites did not ablate due to insufficient velocity. Indochinites probably re-entered at velocities below 3 km/sec. Baker G. 1963. Form and sculpture of tektites. In: O'Keefe J. A (ed.) Tektites. University of Chicago Press, Chicago. 1-24. Fenner C. 1934. Australites, Part I. Classification of the W. H. C. Shaw Collection. Transactions of the Royal Society of South Australia. 58: 62-79. McColl D. H. 2008. The rolled tektites! Meteorite Magazine. 14 (3): 12-14. Plait P. 2002. Bad Astronomy: Misconceptions and Misuses Revealed, from Astrology to the Moon Landing "Hoax". John Wiley & Sons. Vand V. V. 1965. Astrogeology: Terrestrial meteoritic craters and the origin of tektites. In: Advances in Geophysics, Academic Press, New York: 11: 1-114.